The Apostolic Exhortation Sacramentum caritatis by Benedict XVI (dated February 22, 2007) was released the day before yesterday by the Vatican. It is a long document fully supportive of Vatican II and the Liturgical Reform of Paul VI, which includes the installation of the New Mass. According to a ‘tradition’ of the post-conciliar Popes initiated by Paul VI, the apostolic exhortations are documents that are not authored by the Pope, but by the Synod of Bishops. The Pope just signs it after some experts put together a uniform text from the different conclusions of the synod. This particular document presents the conclusions of the 11th Synod of Bishops held in Rome in October 2005. This collegial innovation is a way to make the Pope look like a Queen Elizabeth, who is obliged to sign whatever the Chambers send to her desk. This is the second document by Pope Ratzinger, the first being Deus caritas est. Here, he returns to the term caritas, love, a preferred theme of the ‘theology of love’ or ‘theology of communion,’ a progressivist school to which he belongs that represents a split inside the Nouvelle Theologie [New Theology] born under the inspiration of the late Fr. Hans Urs von Balthasar. The document is quite extensive and prolix. I don’t intend to analyze its entire content here. I will just look at the two passages that address the question of the Mass in Latin. None of the above observations should cast doubt upon the importance of such large-scale liturgies. I am thinking here particularly of celebrations at international gatherings, which nowadays are held with greater frequency. The most should be made of these occasions. In order to express more clearly the unity and universality of the Church, I wish to endorse the proposal made by the Synod of Bishops, in harmony with the directives of the Second Vatican Council, that, with the exception of the readings, the homily and the prayer of the faithful, such liturgies [New Masses] could be celebrated in Latin. Similarly, the better-known prayers of the Church's tradition should be recited in Latin and, if possible, selections of Gregorian chant should be sung. Speaking more generally, I ask that future priests, from their time in the seminary, receive the preparation needed to understand and to celebrate Mass in Latin, and also to use Latin texts and execute Gregorian chant; nor should we forget that the faithful can be taught to recite the more common prayers in Latin, and also to sing parts of the liturgy to Gregorian chant (Vatican Internet Site). Therefore, the New Mass is permitted to be said in Latin and with a generally more conservative tone throughout. Why is this being allowed now? First, to avoid the reaction caused by the abuses in the celebration of the New Mass that is turning more and more people to the Tridentine Mass. Second, to attract those conservatives or traditionalists who are nostalgic about the old ceremonies and chants, but do not care too much about principles. In short, it is to avoid a hemorrhage of the public from the New Mass toward traditionalism, and also drain the ranks of traditionalism as much as possible. A very different situation arises when, in the interest of more conscious, active and fruitful participation, pastoral circumstances favor small group celebrations. While acknowledging the formative value of this approach, it must be stated that such celebrations should always be consonant with the overall pastoral activity of the Diocese. These two sentences point to the audience being addressed here: Those priestly organizations or individual priests who submit themselves to the demands of the Ecclesia Dei Commission in order to say the Tridentine Mass. They receive such permission insofar as they agree to never publicly discuss Vatican II or the New Mass; they also promise to be obedient to the Bishop of the area. These celebrations would actually lose their catechetical value if they were felt to be in competition with, or parallel to, the life of the particular Church. This translates: If these groups or individuals should ever criticize the New Mass or make efforts to bring persons who assist at it to their Masses, they could lose their celebret - it would be "a competition." This sanction would also apply should they restore traditional norms for penance, fasting, modesty in dress, etc. which conflict in any way with those of the local Bishop: this would be to establish "a parallel life." Should this occur, they would run the risk of either being excommunicated or having to be incorporated into a Novus Ordo parish. In this regard, the Synod set forth some necessary criteria: small groups must serve to unify the community, not to fragment it; the beneficial results ought to be clearly evident; these groups should encourage the fruitful participation of the entire assembly, and preserve as much as possible the unity of the liturgical life of individual families. Persons from both the Tridentine Mass parish and the New Mass parish 'ought' to socialize, e.g. at gatherings to show ‘evident results’ that they are ‘unifying the community,’ that is, the Diocese. The choir of a Traditional Mass parish could be invited to perform in a Novus Ordo parish to embellish its liturgy or teach its choir Gregorian chant. In the Traditional Mass parishes, the priests ‘should encourage the fruitful participation of the entire assembly.’ Even though there are no examples given in the text, it is clear that some sort of dialogue in the Mass, the kiss of peace, lay people reading the Epistle, and so on, will have to be established to fulfill such demand. Probably the concrete applications will be left to the local Bishop to decide for each particular case. In their compromise made through Ecclesia Dei, those organizations – the Fraternity of St. Peter, Institute of Christ the King, the Fraternity of St. John Vianney, Good Shepherd Institute, etc. – probably thought that they could agree with Vatican demands once and for all. Their calculations were wrong. This new document sets them on a slippery ramp of increasing concessions to keep their precarious canonical status. Where does this ramp lead? It clearly tends to close the distance as much as possible between those who go to a Tridentine Mass approved by the Bishop and those who go to a New Mass said in Latin. Between these groups there would be no doctrinal disputes and a cordial social harmony would exist. That is, the two communities would be reduced to something like two clubs of Latin language admirers. These are the main points that came to my attention in a quick reading of the document. Certainly there would be more to say after a more careful analysis. So, we have two new ingredients on the table from this document: the New Mass in Latin and new demands for those traditionalist priests who have compromised. 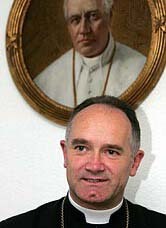 Is Bishop Fellay ready for a compromise? The framework of the measures set in Sacramentum caritatis does not feed the hope in this dream. So far, the only Latin Mass allowed to be said everywhere is the New Mass. It looks very much like what is coming is not a concession of privileges, but a threat: If SSPX does not follow the path of compromise taken by other Tridentine Mass groups, new sanctions could be applied. Let us wait, watch and pray that progressivist traps are not successful. 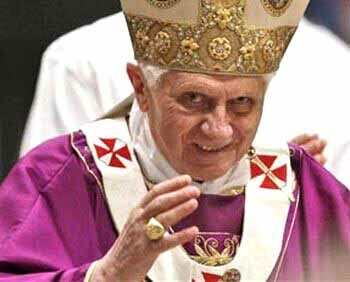 Is Benedict Weakening the Papacy? Card. Ratzinger: Gaudium et Spes is a "Counter-Syllabus"